Cryptocurrency mania hasn’t been ending despite considerable price swings over the past couple of years. Goldman Sachs, Fidelity, Nasdaq, and several other institutions have started participating in emerging markets, leading governments to work on legislative frameworks to give these emerging markets a legal cover. Cryptocurrency markets are entirely different from other financial markets because the majority of investors make mistakes at the beginning of their trading career. There are many resources available on the Internet that would help you in understanding how cryptocurrency markets work. 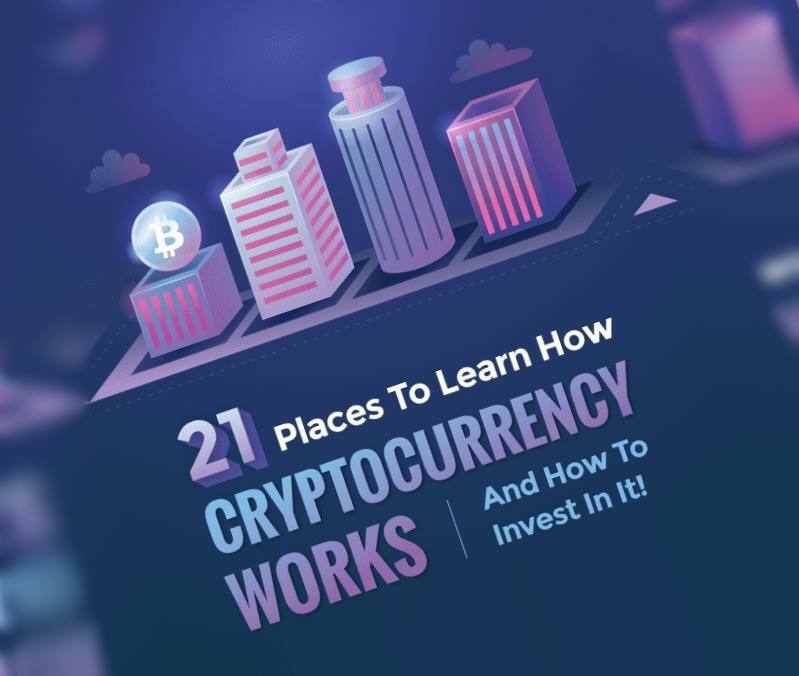 Below are 21 best places where you can learn how to invest in digital money. The above infographic, created by ICOHolder will definitely help you in understating how cryptocurrency works. This book offers sufficient material for dummies because the author, Andreas Antonopoulos, has covered all the critical aspects related to bitcoin and its blockchain technology. The author dives deeply into the entire business model of the largest cryptocurrency. The book clearly explains how a peer-to-peer electronic transaction occurs with the help of blockchain technology along with different components that are connected to one another to provide a borderless currency. This book is one of the best sources for beginners to deeply understand how they can make money by finding opportunities in cryptocurrency markets. The book highlights how cryptocurrency works along with a number of investment and portfolio management strategies to deal with volatile moves of crypto markets. This trustworthy book will foster the understanding the intrinsic value of bitcoin and how these currencies can become a viable medium of exchange. This book sheds light on all the key aspects of bitcoin and its blockchain technology. Indeed, the book focuses on why bitcoin could turn out to be a very valuable asset and store of value rather than its label of "digital currency." In this book, author Andreas Antonopoulos expresses his opinion about the philosophical, social, and historical implications of bitcoin. Joel Comm and Travis Wright offer technical and fundamentals analysis about Bitcoin and the other, smaller coins according to the market conditions. Their casual but informative style is one of the best factors of this podcast. Along with the educational material, they also cover topics that help investors in understanding the global business environment for cryptocurrencies. Hosted by Patrick O’Shaughnessy, this podcast focuses on advanced investing strategies associated with bitcoin and cryptocurrency markets. The host of this podcast invites industry experts to obtain their opinion on changing market dynamics of the crypto sphere and ask them how to deal with market volatility. Unchained is the most prominent and reliable brand in the crypto world, featuring host Laura Shin’s deep delves into the technical and fundamental factors of cryptocurrency markets. Laura also invites top industry experts to get their opinion about cryptocurrency market dynamics and she strongly believes blockchain and cryptocurrencies are about to change every trust-based interaction of our lives, including financial services to identify, health care, and our Internet of Things (IoT) devices. This is one of the best resources for beginners, as the course teaches every essential feature of cryptocurrencies from mining to investing. After completion investors will be able to mine, invest, and trade all cryptocurrencies. The course helps one to understand the mistakes that new investors generally make in crypto markets. Indeed, the author also describes the pros and cons of all significant cryptocurrencies as well as the procedure of mining these coins. You can find a lot of information about cryptocurrency exchanges and wallets through this course. Learn about cryptocurrency with Chris Haroun here. 8. Cryptocurrency Trading Course 2018: Make Profits Daily! Cryptocurrency trading is quite different from the stock market and forex trading due to the huge amount of volatility; digital coins have the potential to make or break billions of dollars in mere hours, and so traders must do deep research before making investments in crypto coins. The host, Michael Suppo (Suppoman), believes if you follow the tips and tricks described in the course, you will end up “making profits daily.” This course covers both beginner and advanced trading strategies and focuses on improving traders’ day trading and short-term investment strategies. Learn how to invest in cryptocurrency with Suppoman here. This course basically deals with the technical and technological aspects of cryptocurrencies rather than trading strategies. The course is offered by Arvind Narayanan of Princeton University, who believes it is important to understand how cryptocurrencies work at a technical level. The course helps users to understand how Bitcoin works, as well as how secure they are, what makes them different, what determines their price, how anonymous its users are, and what the future might hold. After reading all these aspects, the reader will be able to understand all the technical factors related to bitcoin, teaching them to make better bets. Learn about cryptocurrency technologies with Arvind Narayanan here. This is one of the biggest forums for investors, beginners, and developers to expresses their opinion about market behaviors. Traders and newbies alike can ask fellow members for information on any topic. In addition, the forum is divided into different categories such as bitcoin discussion, development & technical discussion, mining, economy, trading discussion, and more. Sign up at the Bitcoin talk forum here. Coinmonks is a technology-focused publication website that embraces all technological innovations which are resolving the long-standing problems the world has faced and continues to face. With the slogan of “Learn, Build, and Thrive,” Coinmonks allow users to post their ideas on a variety of topics including: Bitcoin stories, Lightning Network stories, and Blockchain. The forum also enables users to post jobs and other informational content regarding crypto and blockchain. They have developed an attractive and user-friendly website for both readers and contributors which is really helpful for both beginners and advanced investors seeking to expand their knowledge about cryptocurrencies and blockchain technologies. Find out how cryptocurrency works at Coinmonks. With a community of 977k people, r/Bitcoin is working towards closing the gap between investors, developers, and beginners. This forum allows users to simply exchange business ideas. r/Bitcoin is a subforum of Reddit, which is itself one of the largest online forums. r/Bitcoin only deals with a range of topics, including bitcoin, altcoins, and other news related to the industry. Find out how to invest in cryptocurrency at Reddit (AKA the front page of the internet). This is one of the best websites because it offers real-time cryptocurrency data and is a most reliable source for the prices of more than 2000 coins, percentage change, and the market cap of every asset listed on crypto exchanges. The website also provides daily data of top gainers or losers. Traders can also use its tools, including historical data, currency converter calculator, crypto glossary, and website widgets. Investors can also use their services, including: an events calendar, advertising, newsletters, and professional API. CoinDesk started publishing data and news in May 2013, and was founded by serial entrepreneur Shakil Khan, an investor of BitPay. CoinDesk provides commentary on daily market activities along with guides for those who are new to digital currencies. The website was acquired by Digital Currency Group in January 2016, for an amount of $600K. Coindesk currently stands among the top-rated cryptocurrency news publishing websites on the web and offers significant information about ICOs and events in the cryptosphere. Visit the CoinDesk crypto website here. This is one of the best sources of information about ICOs and other crypto related projects. It is a holding company that analyzes, invests in, and develops innovative blockchain projects with the goal of creating economies of self-expressive individuals and robots. CyberFund offers analytical reports, product updates, information about events and conferences, and tools for blockchain investors and developers. It recently launched three new blockchain products: web3.agency, golos.io, and cynerstudio. Visit the CyberFund Medium blog here. Prepared by the Chinese trading giant Bitkan, this is a pioneering documentary about bitcoin in China. The documentary describes the key information about bitcoin and shows potential benefits of cryptocurrencies in the financial world. This documentary presents the history of bitcoin from the Chinese bitcoin community’s perspective. This forty-five minute documentary allows cryptocurrency lovers to understand the need for decentralized, safe, cheaper, and faster transaction systems. This documentary explains how financial institutes and central banks have strict control of the global financial system. A dedicated group of activists and entrepreneurs, proponents of cryptocurrencies and the decentralized financial system, made this documentary, strongly believing that the current financial system will crash at any moment. This documentary focuses on the importance of ordinary citizens’ potential to become their own bank. The Bitcoin Gospel covers all the features of a digitalized financial system with which one can instantly send money from one place to other without a middleman. The world has applauded the invention of blockchain technologies which have resolved many long-lasting problems the world has continued to face in spite of other increasing digitalization trends. Monty Munford speaks here about the revolution of blockchain technology that has completely changed the business structure of many organizations. He touches upon many important points of blockchain technologies including how blockchain companies can improve their stories, the development of the blockchain ecosystem, promising applications of blockchain technology, characteristics of valuable tech companies, what should change, and where the sector is going. K-DUB, the host of Crypto Zombie, share his thoughts on daily cryptocurrency market activities, presents updates, and a crypto economic calendar. K-DUB presents things in a simple and easy way, which makes it perfect for beginners. He covers news, coins performance, and blockchain events in a single show. Watch Crypto Zombie on YouTube. With more than 316K subscribers, Nicholas Merten shares his opinion on the daily cryptocurrency market activities through his youtube channel DataDash. He is a data analyst by profession, and keeps a keen eye on the cryptocurrency market. He also shares his investing and portfolio management strategies with the audience. Learn how to invest in cryptocurrencies with Nicholas Merten. The Swedish blockchain speaker Ivan Liljeqvist is the host of Ivan on Tech (190,000 subscribers). He shares his ideas about crypto markets and blockchain technologies and has a strong hold on the technical side of crypto coins and blockchains. Cryptocurrency markets are one of the best places for investors looking to make big, short-term profits. The huge amount of volatility and big price swings creates several profit-making opportunities for investors who keep an eye on market activities and market fundamentals. Find out how cryptocurrencies work with Ivan Liljeqvist. Disclaimer: Digital Information World (DIW) has affiliate partnerships, so we get a share of the revenue from your purchase (from some of above Amazon links). Risk Disclosure: Everything DIW provides on this page/website is purely for educational and informational purposes. All information contained herein should be independently verified and confirmed. DIW do not accept any liability for any loss or damage whatsoever caused in reliance upon such information or services. Please be aware of the risks involved with any trading/business/investment done in any financial market. Avoid trading with the money that you cannot afford to lose. When in doubt, consult a qualified financial advisor and experts in the industry before making any investment decisions.